Well folks, you have just a little over 2 weeks to get everything ready for the scariest night of the year! I know some of you have been planning, prepping and decorating for weeks. Others, like my sister, are still debating what she will be putting up in the yard and in the house. My family really gets into Halloween, so we start making decisions on all things related towards the end of the summer. The kids have had their costumes chosen for a while and we have already begun to decorate by the first of October. Because Caitlin’s birthday is the week before Halloween, we always try to find family fun Halloween games for all of us to play. When we are trying to find a new game to play, when I find one, I want to share them. 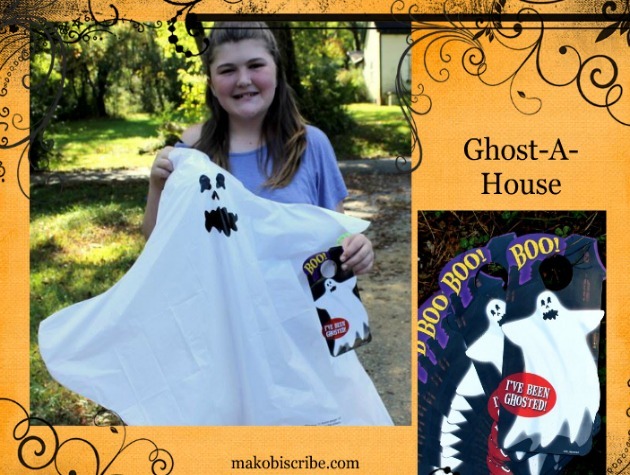 With the very clever game from Ghost-A-House, you and your family will be in stitches! Ghost-A-House, from Colorado, is one of the most hysterically family fun Halloween games I have ever heard of. The concept is much like playing tag, but on a sneakier and larger scale. This is something that families and groups can play that will be sure to start a yearly tradition. Once the word spreads throughout the neighborhood, everyone will be eager to get in on the ghostly game. The kit comes with a 4-Piece LED Ghost kit, 12 door hangers, Felt goodie bag, Website registration tag, Ghostly mission sheet, instructions, LED light & lantern and Ghost material. So, the way the game works is you first register your one of a kind ghost online and list up to 12 friends you want to include. Now you put your ghost together, which takes about 1 minute and full up your goody bag with treats. Now go to the first house, hang your ghost, ring the bell or knock and take of running! You definitely do not want to be caught! Whenever a person is “ghosted”, they can find out who did it and you can track where your ghost goes. This is such a cute and easy game for your family to play. We got our friends involved and the kids want to keep playing it with new friends, at school, at church and anywhere else they can think of! You can purchase the Ghost-A-House game from their website for $19.99. Be sire to follow them on Facebook and Twitter. We’d probably ghost my son’s girlfriend’s house first – she has a lot of younger siblings who would love to get in on something like this! I’d ghost my sister first (she was born on Halloween). My best friend’s house would be first. my parents house would be first. The house across the street! My good friend and neighbor, Terri. She’ll get a kick out of it, and so will her grandson. What a fun idea! My friend Amanda! She needs some laughs lately! I would ghost my brother’s house first. We have lots of families in the neighborhood with children. We’d probably start with the neighbors across the street. This sounds like sooo much fun!! Love it, I would have trouble deciding who to do first!! Definitely my neighbor and sons best friends house..oh what fun! I’d ghost my brother. He’d really get into the game. I would Ghost my son. He would get a kick out of it! I would ghost my 9 year old grandsons first. They wouldn’t expect it from me. I would ghost my teen daughter first. It will be our neighbors kids. I would ghoust my neigbor first! I would ghost my big sis! I would ghost my sister first. I would ghost my husband 1st! I would ghost my mother-in-law first. I would ghost my niece first. I would Ghost my mom first! I would Ghost my neighbor first!